Get ready for a fun four days of Christmas decor, crafts, recipes, and printables. 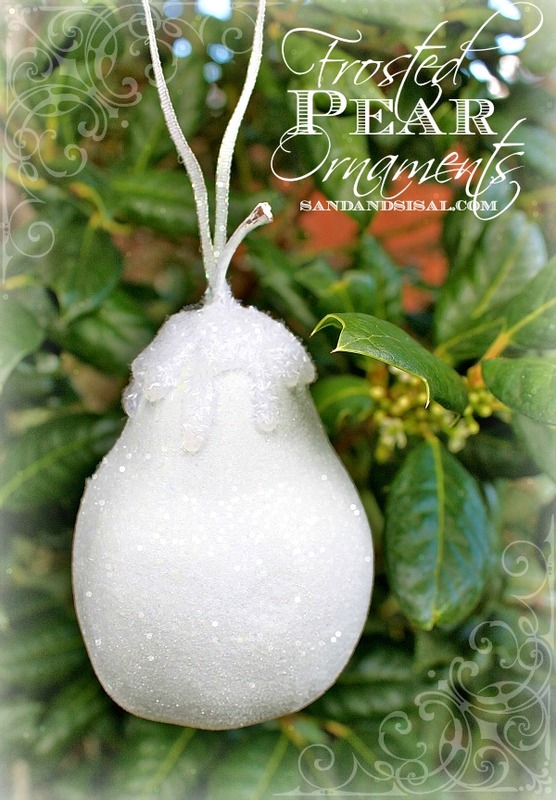 Today I want to share with you how to make these simple and pretty Frosted Pear Ornaments. 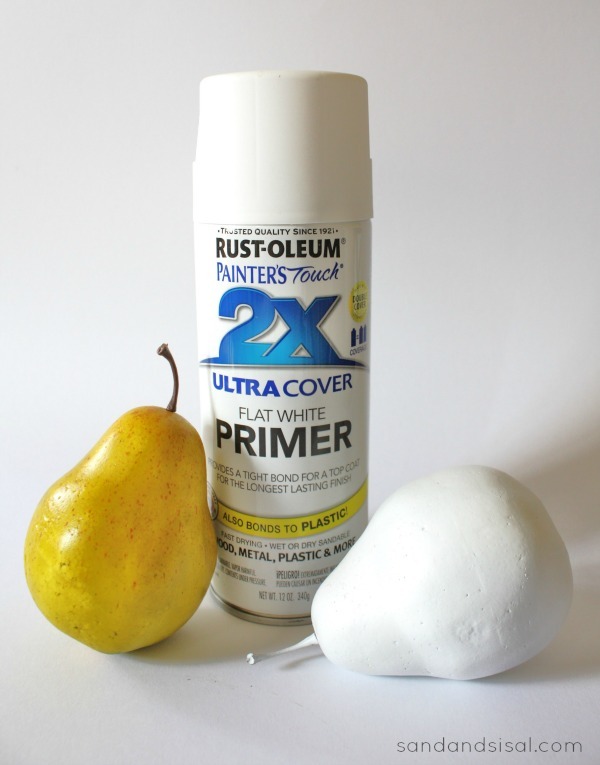 STEP 1) Spray your faux pears with a nice coat of white primer or feel free to use white craft paint. Allow to dry. STEP 2) Coat the pears with a layer of decoupage medium. I used the Martha Stewart Glitter Decoupage. 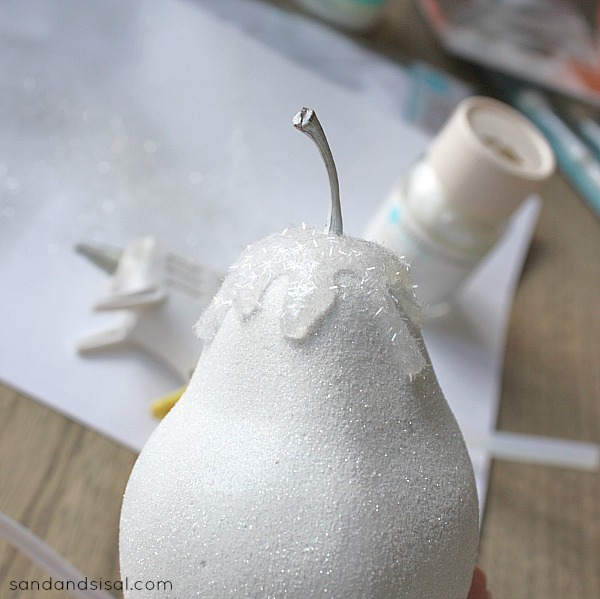 STEP 3) While still tacky, sprinkle the ultra fine white glitter over the entire pear surface. Allow to dry. Step 4) With your hot glue gun, drizzle a layer of hot glue over the top of the pear, so it looks like frosting dripping down. Immediately sprinkle the hot glue with the white tinsel glitter. Step 5) Create a loop out of ribbon and hot glue the ribbon to the base of the stem. 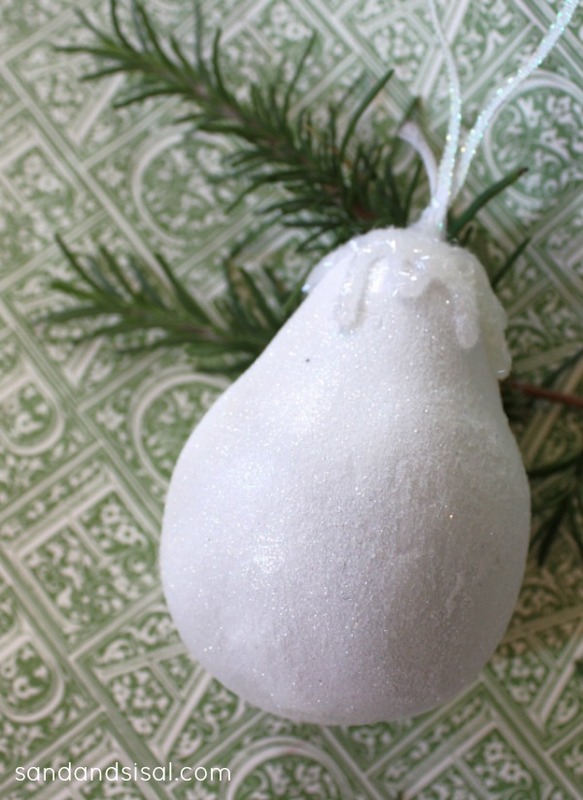 These Frosted Pear Ornaments are very easy to make in a short amount of time and will stand sparkle with a pearly shimmer on any wreath or Christmas tree. Be sure to follow along with the blog hop for more fun Christmas crafts, decor, and recipes. 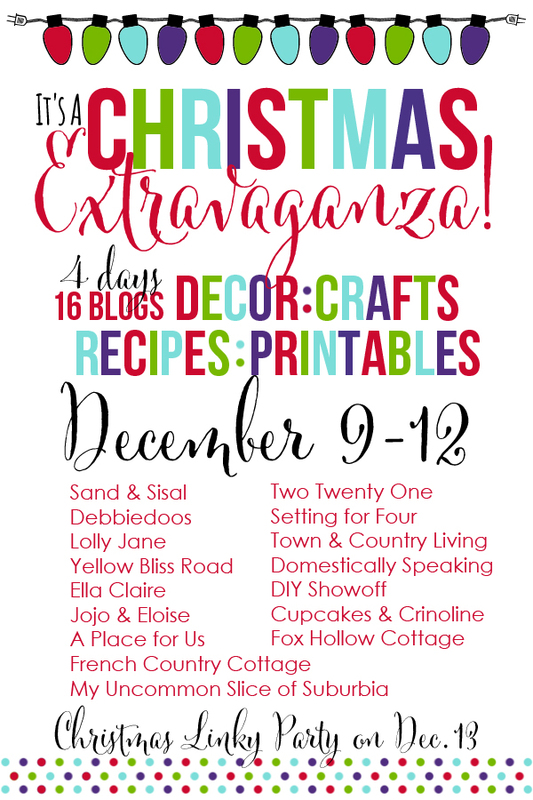 and Friday it’s Your turn… It’s the Christmas Extravaganza Linky Party. Come share your Christmas décor, recipes and more! 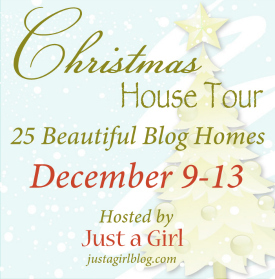 Also this week I’m participating in a Christmas House Tour and it starts today at Just a Girl. Come visit! These are so very cute and so very WINTERY!!! I LOVE them. Thanks for sharing this fun idea with us! Love the dripping snow with the glue gun! That glitter is so cute too. I don’t have that one…. 😉 You know I “need” it now right? Happy Holidays!!!! What a great idea! I love the tinsel glitter! Oh I do to! It’s so sparkly! Thanks for stopping by Georgie! That is so festive and fun! Love it. These are so pretty! I love the effect of the hot glue dripping on the top, perfect touch! I am totally loving this idea- they are so cute!!! You’re ornament is absolutely beautiful, Kim. It reminds me of sugar plum fairies and a snow village. Thanks for sharing the tutorial. 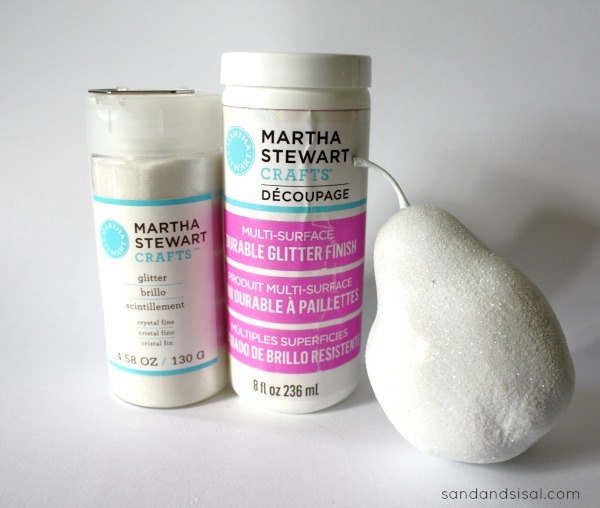 I have some paper mache pears in my craft stash that I will try this one.